All of Crain's Integrated Petrophysics Lectures can be ordered individually from this page. There are 39 individual lectures to choose from - mix and match to suit your personal needs. Each lecture is complete with a narrated slide show, full colour lecture notes, and exercises. 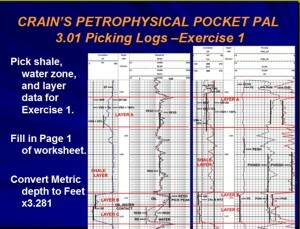 Use Crain's Integrated Petrophysics Lectures as assisted self-study course for individuals or as part of a monitored in-house study program for the entire exploitation team. These lectures are also suitable for a university / tech school semester environment. These practical, no-nonsense lectures are time-tested in major and independent oil companies, service companies, consulting firms, and government agencies, and are backed by 50+ years of worldwide experience. As a low-cost alternative to in-house presentations, consider using Crain's Integrated Petrophysics Lectures as a technically sound alternative. FREE Sample AV Lecture FREE Sample Reference Manual. 1. Decide which license applies to your situation. 2. Click the "Buy It Now" button in the table below these instructions. Set "Quantity" to "1" for Single-User License (default). Set "Quantity" to "10" for Corporate or Associate Instructor License. Set "Quantity" to "5" for Academic License. 4. Click the "Update" link just below "Quantity". 5. Then follow the PayPal instructions.